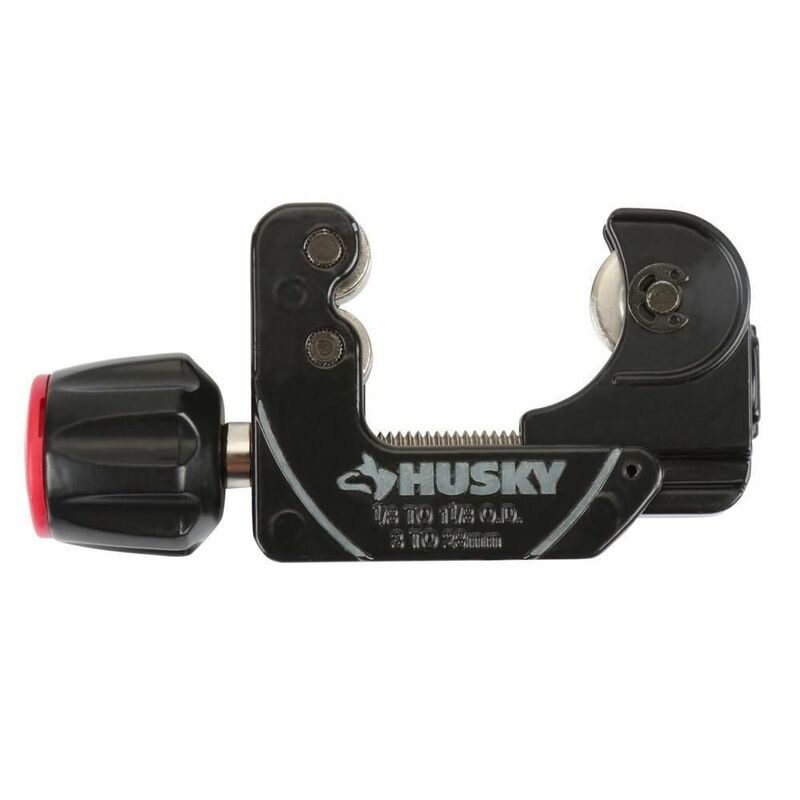 Use the Husky Quick Release 1/8 in. to 1-1/8 in. Mini Tube Cutter to make clean, square cuts on copper, brass, aluminum and thin-wall conduit (all sold separately). This tool features a convenient quick adjustment button to facilitate fast size adjustments to various sizes of tubing. Fine adjustments for cutting can also be made using the knob at the base of the tool after the quick adjustment action is performed. An Extra Blade is included and can be stored in the Knob. This high quality steel, heavy duty pipe wrench is perfect for the professional and the do it yourselfer. The carbon steel jaws feature milled and sharpened teeth for maximum gripping power. Extra long high visibility handle provides increased torque and leverage. Knurled adjustment ring makes changing sizes easy. Quick Release Mini Tube Cutter Use the Husky Quick Release 1/8 in. to 1-1/8 in. Mini Tube Cutter to make clean, square cuts on copper, brass, aluminum and thin-wall conduit (all sold separately). This tool features a convenient quick adjustment button to facilitate fast size adjustments to various sizes of tubing. Fine adjustments for cutting can also be made using the knob at the base of the tool after the quick adjustment action is performed. An Extra Blade is included and can be stored in the Knob. Quick Release Mini Tube Cutter is rated 4.2 out of 5 by 204. Rated 5 out of 5 by Tpratt from Made several cuts with the tool and it cut prefect each time. I am still out about the quick rele... Made several cuts with the tool and it cut prefect each time. I am still out about the quick release function if it was necessary or not, or just market hype. It seemed I was using the knob to open and close the jaws anyway. And if you use the quick release, you still have to use the knob to get the jaw to stay down on the pipe. Rated 5 out of 5 by DIYer from Great little cutter.... Great little cutter. Rated 1 out of 5 by Phillip from This product is junk. Returned immediately. ... This product is junk. Returned immediately. Rated 3 out of 5 by JCBaja from I only needed to cut a few pieces of 1/2... I only needed to cut a few pieces of 1/2 inch copper pipe and it did the job. Rated 5 out of 5 by Spanky from Clean and easy cut each time. Clean and easy cut each time. Looking to cut a shower curtain rod, will this product cut through a thin stainless steel tube? This cannot cut stainless steel tube.